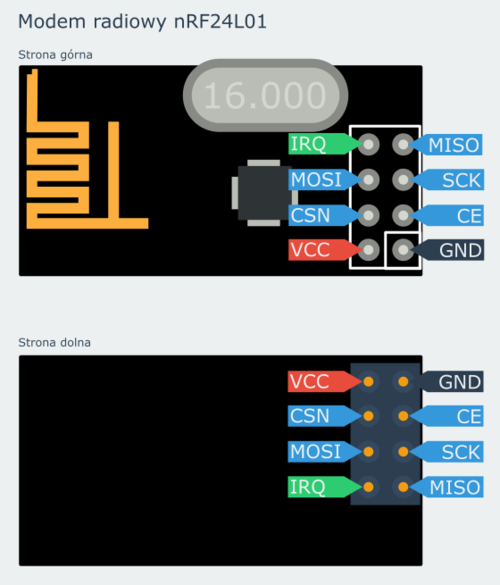 There are many options how to connect Your Arduinos wireless. One of options available is – nRF24L01+. It costs only 6zł (1.5 EUR) per node and it allows you to connect many devices without using a single wire. nRF24L01 uses radio waves (in 2.4 GHz band) to contact with other modules. Modem works on 2.4GHz frequency and has 100m range (at best). You can communicate with different baud rates: 250 kbps, 1 or 2 Mbps. High baud rate allows users even to send video material in 720p resolution (very similar to Youtube). During operation modem uses less power that single LED. During receive power consumption is around 12mA and during transmission 11mA. According to datasheet users can set automatic power saving modes. During this states module consume only 320 µA (when data is waiting for transmission), 26 µA (when there is nothing to send), 0.9 µA (in shutdown). nRF can operate on voltages between 1.9 and 3.6V. The input pins tolerate the 5V logic, so without any problems this module can be connected to the most popular development boards like Arduino. You don’t have to use any logic level converters when connecting this module to Arduino working in 5V logic. Most models of Arduino (UNO, Mega, Leonardo and more) are working with this logic levels. Operating bandwidth is divided on 125 channels (separate frequencies). Thanks to this, you can create a network of 125 independently working modems in one place. Every channels has its own address. Well, to be honest it can have up to 6 addresses. This addresses are numbers and they represent specific device connected to network which will receive data. Length of the address can be from 3 to 5 bytes. This gives us the addresses from 24 to 40 bits. With the lowest value of the address it is 17 million combinations. Longer address value can be used as 5 letter names (5 chars at 8 bits give us 40 bits in total). nRF24L01 automatically creates data packets. You are only sending what you want to the specified address. Modem creates a data packet, which is protected from errors with a CRC. When there’s a problem with sending packet, device automatically will try to send it one more time. If sending is successful, receiving module automatically sends a confirmation to the transmitting module. nRF24L01 uses SPI interface to communicate with the MCU. It uses 5 wires. nRF24L01 module is being sold on breakout board with build in antenna. The pcb only requires a connection with the development board or MCU. Size of the whole module is very small (1.55×2.9cm). From the bottom you can see two rows of communication pins. As it was written before, module communicates with the controller via SPI interface. 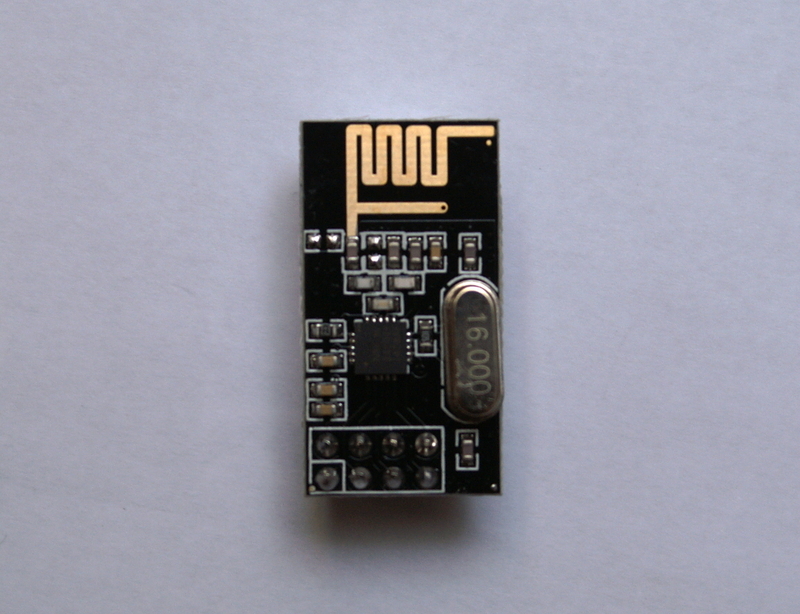 CSN – low state on this pin indicates that with this module the controller wants to communicate. CE – signal activating receiving and transmitting. In receive mode, the high state indicates that he wants to receive. In transmit mode, pulse sends one packet of data. IRQ – interrupt output. It does a low state pulse when data is waiting to receive, or when the data was properly sent.